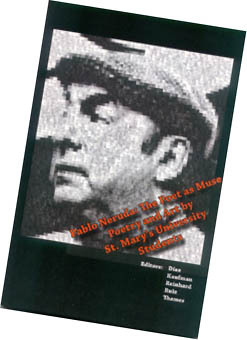 Pablo Neruda: the Poet as Muse is the culmination of a semester at St. Mary's University in which students and faculty joined with faculty members and musicians from the University of Valparaiso, Chile, in celebrating the centennial of the birth of Chilean poet Pablo Neruda. The book is the project of an advanced English class conducted by Dr. Gwendolyn Díaz of the St. Mary's University Department of English. The works in the book, art and poetry, are by students in the class and were inspired by the poetry of Pablo Neruda. 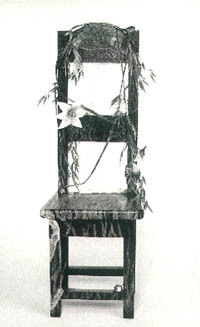 Inspired by Neruda's "Ode to a Chair"
Torre de Lus, bella tristeza. Tu ojo, brillando sobre un mar violento, turbulento. El cielo donde busco esa estrella que me guía estando perdido. Tu belleza, visible, perfora miles de millas. Tú eres la reina de este mar. Tú eres la que dicta el meneo. No sabes que esperas pero te mantienes firme, brillando. ¿Para que brillas si inundas, despiadadamente a los que se acercan?